Social Enterprise is neither a conservative nor a liberal idea. It exists outside of politics because social enterprise does not address any interest in conflict or competition with any other interest, simply because it is a voluntary activity. It by-passes any direct government involvement and asks the 'business community' to donate and direct part of its revenue to nonprofit organizations in order to support the needs of the communities they serve. Our society asks the business community to not harm the environment and in fact to be part of the process of protecting and improving it for the benefit of mankind. It 'asks' by doing business with companies that support this mandate, and withholding its dollars from those that do not. It is now becoming the case that our society is 'asking' that business also take social responsibility for the communities it serves. It does this by 'preferring' to do business with people and companies that Give Back. A strong trend is for consumers to look for companies that Give Back when they buy products and use services. As a society we are beginning to look for it, coming to expect it, and as this trend continues, actually 'demand it' in return for our dollars. REBSEA Is playing its part, starting with the real estate industry, by demonstrating that people can CHOOSE to work with real estate agents who Give Back. We are starting by forming a strong network of FOUNDERS who are already supporting Nonprofits through their business. 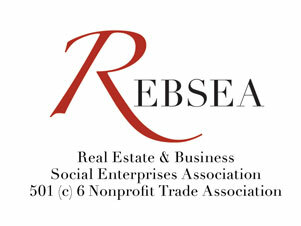 Next REBSEA will offer membership to other real estate agents to whom we will demonstrate that Giving Back is good business and good for business. The simple FACT is that people prefer to do business with people who Give Back and it is smart to brand one's business accordingly. that it is good for business. receive a donation at closing. who prefer to do business with those who give back. we have not organized in such a way that provides infrastructure for charitable giving to flourish. as the "real estate agent who gives back" and encourage by example others to do the same. Now back to the premise of our first issue of this newsletter: Social Enterprise is transforming commerce as we know it. It is happening in many sectors of our society and our economy.